Bleak Night was screened on the 18th June 2011 at the Edinburgh International Film Festival. Following its success at the 2010 Pusan International Film Festival, where it won the New Current Award, Bleak Night has impressed audiences worldwide with its gritty look at teenage relationships and the potential tragedy that can result when friendships fall apart. The debut film from Korean writer director Yoon Sung-hyun is even more notable given that it serves as his graduation project from the Korean Academy of Film Arts. Shot solely on a hand-held camera, its ability to capture the audience’s attention with its realistically grim portrayal of teenage angst is nothing short of commendable. Set in a relatively humdrum suburb in South Korea, where there is little for youngsters to do, a middle aged father is desperately trying to get in contact with the friends of his deceased son following his apparent suicide. Taken from Subtitled Online, published online Tue Sep 13th 2011. Since opening the Edinburgh International Film Festival in June, The Guard has taken Britain by storm. With a slick combination of black humour and a sharp witty script, it is brought to life by one of Brendan Gleeson’s best performances to date. Set in Galway on the Irish west coast, garda Gerry Boyle (Gleeson) is an unorthodox policeman who drinks on the job, takes recreational drugs and has a certain penchant for prostitutes. Wendell Everett (Don Cheadle), a by-the-book FBI agent, arrives to coordinate an operation against a drug smuggling outfit working in the area. When he is paired with the world-wearied dog, what ensues is a buddy cop film that breaks all the usual conventions. Gerry Boyle is one of those characters who stays with you long after the film has ended. With a relatively crass approach to life, expressed through memorable one-liners and a lack of care of others’ opinions, writer-director John Michael McDonagh provides a refreshing alternative to the fish out of water story. The rapport shared between Boyle and Everett is often hilarious as the Ivy League FBI agent is astounded at the Irishman’s racism and seeming ignorance. An assumption that Everett is from the projects rather than his actual privileged background leads to a hilarious deadpan reaction from him. With lines such as: “I’m Irish, racism is part of my culture,” delivered in a whimsical and harmless way, this is an endearing comedy that offers something relatively unique. Its only drawback lies in the cinematography, which, though good, seems somewhat lifeless in comparison to the strong script and brilliant acting performances. However, this is a minor let down to what is otherwise a highly enjoyable film. This is one of the best comedy thrillers for a long time with an arguably award-worthy performance from Gleeson. Taken from The Student, published Tue Sep 13th 2011. An adaptation of the English novel The Borrowers by Mary Norton, Studio Ghibli’s latest effort sees a deviation from their tendency to keep founder Hayao Miyazaki at the helm. Instead, the film welcomes the directorial debut of Hiromasa Yonebayashi who previously worked as a key animator on some of the studio’s earlier projects. A faithful representation of the novel, but with a definitive Japanese edge courtesy of a script written by Miyazaki; it features something of a change from the usual surreal and far-fetched content of their previous endeavours. With other companies such as Disney Pixar favouring computer rendered images, there have been fears in recent years of the end of hand drawn animation, but Studio Ghibli once again prove that the old fashioned method is just as captivating now as it ever has been. Set in a quaint suburb away from the busy streets of Tokyo, the film follows a headstrong girl named Arrietty (Mirai Shida) who is part of a family of tiny people living beneath the floorboards of an old country house. Spending her days trying to remain unseen for fear of what might happen were she to come into contact with a human, she is troubled by a burning desire to know whether or not there is anyone else out there like her. Mainly venturing out only in the early hours of the night when everyone is asleep, she and her family search for food and other items which they are able to take away unnoticed and thus justify themselves as borrowers and not merely thieves or scavengers. Their simple life changes at the arrival of a sickly boy Sho (Ryûnosuke Kamiki), who has escaped the city in an attempt to try and see an improvement in his health. Very quickly he spots Arrietty and through his kind loving nature begins trying to create some form of friendship with her. Yonebayashi’s first feature is a beautiful film that is brimming with underlying themes concerning the loneliness of childhood and the ordeals that one goes through in order to achieve friendship and consolation. It manages to capture the magic of youth where the power of the imagination is used to allow for the possibility of the unreal; a trait that seems to disappear as one ages. With more than a passing parallel to our notion of fairies, who we are told as children exist but are merely very difficult to see, a charm is given to the film that is recognisable to both child and adult alike. The forte of the film can clearly be seen in its attention to detail. It is evident that much thought has gone into the consideration of scale and how human objects appear relative to the borrowers. Being proportionate to humans, it is easy to forget that they are only a fraction of their size, but the way in which Yonebayashi allows them to interact with and make use of their surroundings is truly innovative. Here we see clothes pegs serving as hair clips, teapots as boats, and nails as ladders; even their cups of tea are poured out in one big water droplet. It is this scrutiny that allows the viewer to enjoy the minor and arguably unimportant moments of the film, which would normally be so easy to miss or ignore. Once again the Ghibli team have managed to create a loveable animal character in the form of a rather chubby cat intent on capturing Arrietty and not too dissimilar to the cat bus that features in My Neighbour Totoro. Its rather feeble attempts of abduction add comic relief but as the story develops, it too, forms a strong bond with the young girl. The way that predators are portrayed is also worth noting as glowing red eyes suggest a dangerous creature that is best to be avoided, creating a clear divide between what is recognised as friend and foe. The soundtrack comes from French-Bretonne singer and Harpist Cécile Corbel who was offered the job after sending a fan letter and CD to the studio outlining her appreciation of their films. The simplicity of the harp does well to add to the ethereal nature of the film, thus providing a suitable backdrop on which the plot can unfold. The film’s only downfall can be found in its narrative structure. Whilst the premise of the film and its level of detail allows it to retain its enchantment, there seems to be little that one can sink their teeth into. The considerable lack of any major peril, though arguably understandable given its desire to appeal to a younger audience, remains somewhat disappointing. This is also found in the characters themselves who never seem to be explored quite thoroughly enough for them to properly evoke empathy on the part of the viewer. 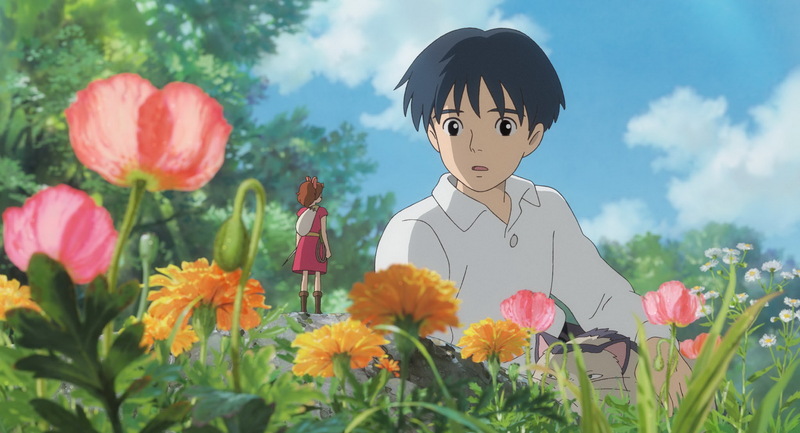 There is no doubt that Arrietty illustrates a clear change from the different and often bizarre quirkiness that can found in Ghibli’s other recent work such as Ponyo and Howl’s Moving Castle. Fantastic creatures and magic have been replaced with much more conservative ideas, but it is this that adds most of the charm to the piece as it allows the viewer to consider the power of the imagination and the importance of friendship. There is no doubt then that despite this change in style, Studio Ghibli retains its mastery over the animated medium.